Naomi Adie of the Peterborough Phantoms Para Ice Hockey Team has swapped her sledge for a racing chair this week as she represents Team United Kingdom at the 2018 Invictus Games in Sydney, Australia. On Thursday she came 4th in the 200m and 400m races. On Friday she won Bronze in the 100m and 1500m races, and Silver as part of the 4 x 100m team. As well as competing, Naomi has been named the Captain of the Team UK Athletics team at the games. Ironically, Naomi started her Para Ice Hockey journey because of Invictus back in 2016. 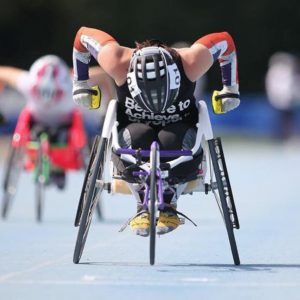 Looking to make the UK Invictus team in Canada she started playing the sport before selection began. Unfortunately Para Ice Hockey was dropped from the games but she continued to train and play for the Phantoms. Fast forward to 2017 and Naomi wanted to go for Invictus again, this time with wheelchair racing. Over 2000 veterans and serving military personal applied to the games with 451 attending the games trails in Bath in April 2018. From the trials, 72 people were selected, and for over 60% of the team this is their first Invictus Games. 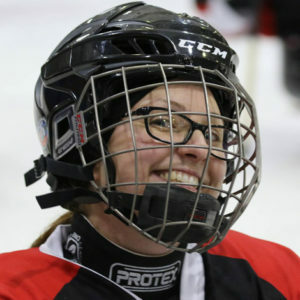 Selection was just the start, with the hard work of training camps as well as the Para Ice Hockey league games keeping Naomi busy throughout the Summer months. Naomi, who said she struggled to adapt after being medically discharged from the RAF in 2014 due to a spinal condition, said her daughter, Vesta, nine, was part of her motivation. She said: “It has taken a lot of grit and determination to get where I am today. I have set myself a goal and thrown myself in; not just for me but for my daughter, so she can see mummy achieve something despite my physical limitations. “To say she is over the moon to be in Sydney with me is an understatement. “I want her to see the person not the disability or injury and this journey is helping with that. I know that doing sport and physical exercise is integral to my journey for both my mind and body.